This book is written by a French author and is one of the most popular young adult books in France. 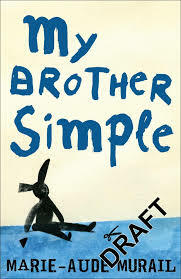 It follows the story of Kleber and his brother, Simple. Kleber is 17 and his brother Barnaby/ Simple is 22. Simple has the mental age of a three year old and carries around a stuffed rabbit called Mr Babbit. Mr Babbit has his own voice in the book which can sometimes be confusing. Simple has been living in an institution called Malicroix near where their father lives. Their mother is dead and their father has married a younger woman who is now pregnant. He is not very interested in his boys. Simple hates living in Malicroix and Kleber knows it, so he decides to take Simple out of the home and takes him to Paris to live with him. But first he needs to find somewhere to live. They start off by living with a great aunt but Kleber is desperate to live somewhere else and be more independent. After a few false starts he finds two rooms in a flat share with some university students. They are Aria and her boyfriend Emmanuel, who are medical students, Corentin, Aria’s brother and Enzo, Corentin’s best friend. Even though they are sceptical about taking on Simple, they eventually grow to love him. Enzo is also in love with Aria and, although she knows, she tries to ignore it. Kleber meanwhile is having romance problems of his own. At college he meets a beautiful redhead called Beatrice and quickly falls in love. In the background is Zahra, another student on his course who he becomes friends with. Zahra falls in love with Kleber but he realises that he will have more luck with Beatrice and starts dating her. Simple goes around in his own little world and they all start to settle in to a routine. Simple is really good at messing up situations and making things awkward for Kleber but he perseveres. Eventually though, things come to a head and, after a series of misunderstandings, things start to go wrong. Kleber and the housemates need to rescue Simple after realising what a positive influence he is in each of their lives.